In November 2012, The NuVasive Spine Foundation™ (NSF) supported a surgical mission trip to Tenwek Hospital in Bomet, Kenya. 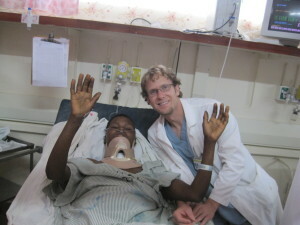 During this mission trip, Lina Rono, a 37-year-old mother of seven children, received life-changing surgery. Lina Rono, a NSF patient, pictured here with Dr. Daniel Galat, recovers at Tenwek Hospital in November 2012.
her injury, she was nearly bedridden and experienced weakness in her left arm due to a C7 nerve root injury. On November 29, 2012, Dr. Daniel Galat performed an Anterior Cervical Discectomy and Fusion (ACDF) procedure to treat levels C5-C7. Today, Lina has recovered from surgery and her arm strength has significantly improved. Lina is now back to participating in activities she once enjoyed with her children before she was bedridden from her injury.